The Fugoo Go packs above par sound quality into a compact weatherproof body. These are speakers that you can knock around on a hike and not have to worry about. It’s not perfect (see: battery life and bass reproduction) but the compromises are minor, especially for the price. When we reviewed the Fugoo Style Bluetooth speaker, we called it “the Bluetooth speaker market's best kept secret.” This statement is still true when it comes to Fugoo’s other speakers like the Go. Like the Style, the Go is also completely weatherproof with an IP67 rating. This means the Fugoo Go can withstand being in up to 3 feet of water for up to 30 minutes. Plus, if water isn’t the only hazard you’re facing, it’s also mud, snow and shock proof, too. What sets the Fugoo Go apart from the competition is its unique mounting strap and affordability – everything considered, at $99 (about £79, AU$129) the Fugoo Go offers tremendous value. The exterior of the Fugoo Go speaker looks just like every other waterproof speaker on the market with its black cloth cover and big rubberized buttons. But what the Go lacks in design flare, it makes up with versatility. Built into the speaker is a bungee cord that you can detach to mount the speaker in various places. Fugoo demonstrates this feature by strapping the Go to the grill of a Hummer in its marketing materials – you know, in case you want to a warzone with a Bluetooth speaker. For more civilian lifestyles, you can use the bungee cord to hang the speaker in the shower. Fugoo isn’t the only speaker with a bungee cord though. The UE Roll 2 also features a bungee cord to secure the speaker to things. That being said however, we think the Fugoo Go sounds a bit better than its waterproof rival – but we’ll cover that comparison in more detail in a minute. On top of the speaker are three buttons for volume down, the “action” button and volume up. Around the side of the speaker you’ll find the power and Bluetooth pairing button. Users can press the volume button to find the battery level, which read aloud by an energetic chap. The Bluetooth button is used to pair new devices to the speaker or to pair the Fugoo Go with another Fugoo Go speaker – a pretty neat feature if you’re willing to double down on a second device. When two Go speakers are paired, you get stereo sound for a more immersive listening experience or extra volume when you need it. Last but not least, there’s a flap on the bottom of the speaker that reveals the microUSB charging port. There’s no aux jack here so don’t expect to be able to use the Fugoo Go with legacy devices. It’s Bluetooth or nothing. The Fugoo Go sounds good, but bass isn’t its strong suit. We found the sound signature to be relatively balanced with energetic highs and lush mids which are perfect for vocal music and podcasts. Bass response is nice and tight, but the speakers just can’t create as much impact as we would have liked. One unique design aspect of the Fugoo Go is that you can lay the speaker flat on its back for 360-degree sound or lay it up on its side for a more directional listening experience. On its back, the Fugoo Go disperses sound well and can fill a small room without any problem. When played directionally on its side, the sound improves with more focused energy, especially in the mid to upper frequencies. Despite some serious skills in being versatile, the Fugoo Go sounds best with vocal-heavy music since the speaker is tuned well for midrange frequencies. Highs sound good but can be overly energetic and fatiguing for some tracks. When playing music through two Fugoo Go speakers, you get stereo separation and increased volume since you have two speakers playing at once. 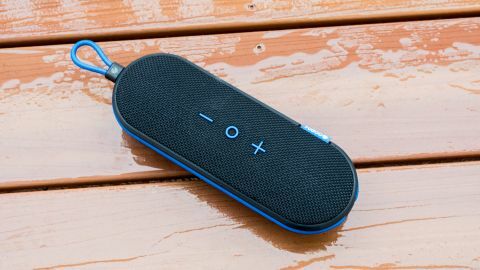 The stereo mode definitely improves the listening experience when you’re in a fixed position at home, but most people will likely use a single speaker to share music outdoors. Stereo pairing isn’t unique to the Fugoo (the Razer Leviathan Mini is another Bluetooth speaker with that functionality), but the Fugoo Go is so affordable that you can actually justify buying two of them for that purpose. Compared to the competition, the Fugoo Go just can’t match the bass response of the Beats Pill+ or the JBL Charge 3 – though, this shouldn’t be much of a surprise when comparing the size of the speakers. The Fugoo Go is much flatter than either the Beats or JBL, so limited bass response is expected. The UE Roll 2 is the Fugoo Go’s natural competitor, but the UE’s loose bass is frustrating. To our ears, the Fugoo sounds better. Battery life is average with up to 10 hours of playback at 50% volume, according to Fugoo. Our tests found this rating to be spot on. That said, when Fugoo’s own Style speaker gets 40 hours of battery life, the 10 hours you get from the Go seems frustratingly limited. The Fugoo Go aren’t the prettiest or best sounding Bluetooth speakers out there but it remains an attractive package for sporty individuals looking for a speaker they can beat up. Music sounds good coming from such a compact speaker and although it lacks bass response, it makes up for it with its unique bungee cord mount and weatherproof design. Best of all, the Fugoo Go only costs $99 (about £79, AU$129), which is a tremendous value when compared to the competition. This makes the Fugoo Go one of the best deals in Bluetooth speakers and one speaker that you actually might buy two of to use in stereo. If you must have more bass response from your weatherproof speaker, check out the Fugoo Style or JBL Charge 3. These alternatives are a bit more expensive but may be worth it for bass lovers or anyone looking for better battery life for longer hikes or full days at the beach. Editor's note: According to Fugoo, the Go will be available in the UK and Australia in the first half of 2017 with exact pricing to be determined.